Can 'Shoppable Shows' Save TV Advertising? Broadcast is slowly dying. Here's a good-looking plan to save it. The trouble with the TV business is that even though more people than ever are paying for TV—whether it's on cable, satellite/telco, Netflix, Hulu Plus, or Amazon Prime Video—fewer people are watching it live. Broadcast TV ads are sold against live audiences. Without live audiences, advertisers go away. For networks that rely on live advertisers (mostly: the broadcast networks), this should be terribly worrying news. Same-day ratings have been falling for two years now, according to Citi Investment Research (first graph below) and there was a 50 percent collapse in broadcast audience between 2002 and 2012 (second graph below). Think about what that second graph is telling us. 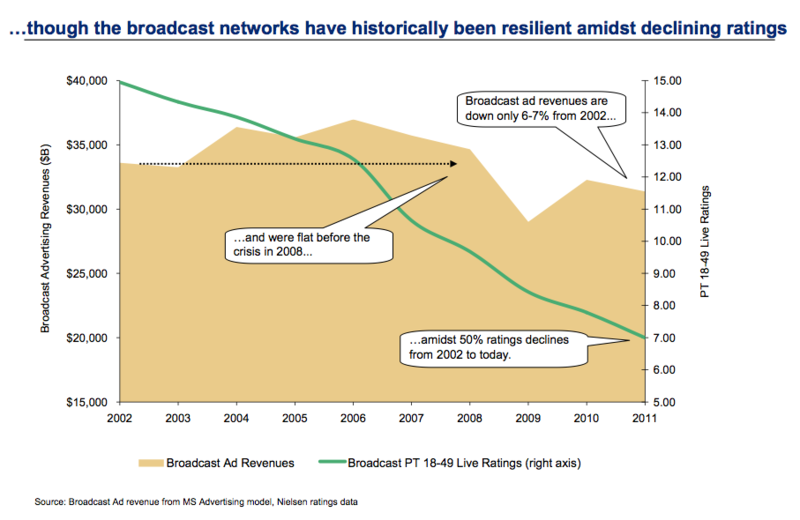 Broadcast ratings are down 50 percent in 10 years, but ad revenue is down only six to seven percent. For now, that buoyancy is good news for NBC, ABC, CBS, and FOX. But in the long run, adjacent advertising goes where the eyeballs go, and the eyeballs are going away. Broadcast will need new ways to make money (besides forcing cable companies to pay more in fees). If you can't sell advertisements around the show, what about selling ads inside the show? For years, viewers have followed TV fashion, and the Web has made it easier to build a community around your sartorial obsession with certain characters. Sites like Worn on TV can catalog every suit, blouse, and shirt, and ask viewers to vote on their favorite ensembles. Viewers can only guess at the wardrobes of their favorite shows, comparing similarly cut shirts and dresses online to approximate a match. But television shows don't have this problem: They know what designers they're paying for which outfit, because they're paying for them. So why not use this information to build a clothing advertising platform off of each show? “Pretty Little Liars” has recently started to “Live-Pin” outfits from the show, and that the makeup department from “Reign” shares the makeup products worn on each character through Twitter ... Meanwhile, “The Mindy Project” currently has a “Shop the Show” feature on its website. “The studio will look through my continuity books and look at the labels that are coming up so they can make sure they’re available to the public when the episode airs,” explained the show’s costume designer Salvador Perez. It's too early to say that "shoppable shows" will provide a good long-term solution for networks with dwindling audiences. It's safer to say, more conservatively, that selling targeted advertising to individuals who have expressed an interest in fashioning their wardrobe on a specific character could mark an interesting twist for broadcast networks. For a few years, the line has been that broadcast programs were for the masses and cable programs are for the niches. But the cable bundle is so vast now that every channel is truly a nichecast and practically no channel is a true broadcast. If that's the right read, the commensurate business strategy should be: Don't worry so much about the overall numbers, and build a business that sells to a niche—one that's clamoring to wear your clothes.